Progressive Charlestown: Yum, clam cakes! 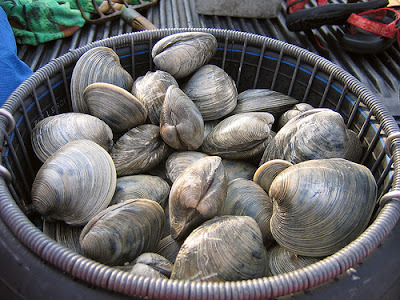 The Rhode Island Seafood Marketing Collaborative, chaired by the Department of Environmental Management (DEM), announces that the 4th annual Quahog Week returns March 25 - March 31. The week-long celebration highlights the importance of Rhode Island's iconic shellfish to the State's economy and culture. Quahogging has a rich history locally, supporting the livelihoods of hundreds of Rhode Island fishermen and women year-round as well as serving as a treasured pastime for Rhode Island families who enjoy digging their own. Demand for these delicious local clams swells in the summer months due, in large part, to the popularity of fresh-shucked littlenecks, clam cakes, and stuffies. But they also make the perfect fare for winter chowders, pastas, and other dishes. Quahog Week shines a light on our favorite local clam, the hard-working men and women who harvest them, and the vibrant local food industry that makes them available to consumers. "Quahog Week is our opportunity to step back and celebrate our wild harvest quahog fishery – as well as our State's amazing array of eateries," said DEM Director Janet Coit. "Whenever I go out to eat, I look for Rhode Island shellfish, and I know I'm not alone. Our flavorful clams are enjoyed by Rhode Islanders and tourists alike, and are shipped fresh throughout the U.S. And going out on the water with our local fishermen has made me appreciate all the more the hard work and dedication that defines our fishing industry. I encourage Rhode Islanders to visit our partnering restaurants and markets, and stop by at one of the two special events, during Quahog Week – and beyond." Rhode Island is known for its food and diverse food cultures. The state's booming local food sector supports more than 60,000 jobs and continues to attract and inspire the imagination of entrepreneurs and innovators. The local fishing industry has been, and continues to be, a vital part of the equation. Thousands of land and water-based businesses are supported by the industry. And local favorites like the quahog "stuffie" are enjoyed by people near and far. For more information about Quahog Week and/or a list of participating restaurants and markets (updated daily), visit www.seafoodri.com or @RISeafoodRocks on Facebook. Also, join the conversation, and share photos of your favorite dishes on Twitter using #QuahogWeek.